During the last 15 years, attention to the measurement of family spillover effects of illness and their inclusion in cost-effectiveness analyses (CEAs) has increased substantially. First, with a focus on direct medical costs borne by the family, followed by attention to the burden of informal caregiving, and most recently, with the consideration of changes in health and quality of life for caregivers and family members [1, 2, 3, 4, 5, 6]. Through this broad diversity of studies in this emerging field, the considerable burden of illness that extends to caregivers and family members has been defined and the magnitude of these effects is starting to be quantified. 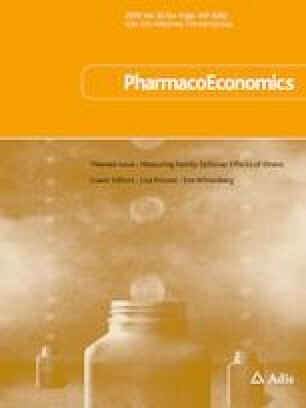 We are delighted to introduce in this themed issue of Pharmocoeconomics on family spillover effects, a set of papers that both presents new applications and addresses methodological questions. Together, these papers highlight emerging work in the field and provide a vibrant snapshot of the rapidly evolving face of this field. This collection of studies makes an important contribution to the literature by documenting different aspects of spillover in varied populations. Importantly, most represent both an application and a methodological advance in this quickly moving space. The topics covered include (1) methods and applications of quantifying informal caregiving time, (2) effects on quality-adjusted life-years, (3) direct effects on caregiver activities such as healthcare utilization, employment, and schooling outcomes, (4) effects of the inclusion of spillover effects on cost-effectiveness ratios, and (5) commentaries on the field. To generate estimates of spillover using quality-adjusted life-years, both indirect and direct methods have been proposed. Three papers in this issue address questions relating to the measurement of spillover health utilities for caregivers and family members. Brown et al. and Lavelle et al. measure health spillover effects in caregivers or parents of children with autism; Brown et al. using indirect methods (EQ-5D and SF-6D) and Lavelle et al. using a direct assessment (time trade-off questions) [12, 13]. An overview paper by Wittenberg et al. provides a comprehensive catalog of caregiver/family member utilities in the literature organized into three groupings: health utilities that isolate the change in quality of life associated with spillover, health utilities of a caregiver/family member sample and a comparison or control group, and health utilities of caregivers/family members alone (no comparison group) . Finally, Canaway et al. present qualitative findings collected at end of life on who is considered “close” when assessing spillover in economic evaluations . Two papers measure direct effects of spillover on caregiver activities beyond informal caregiving time or changes in health utility. Ornstein et al. use data from the US Health and Retirement Study to capture healthcare spending associated with bereavement , and Jacobs et al. use data from the 2013 Rand Survey of Military and Veteran Caregivers to assess changes in schooling and employment . These novel studies using population-level data provide a compelling picture of the wider effects of illness and death on family members beyond what we would typically consider for inclusion in a CEA. Questions on how best to incorporate spillover effects into a CEA have slowed the adoption of these measures. Two papers explore the impact of including spillover in CEA. A systematic literature review of CEAs of Alzheimer’s disease interventions by Lin et al. finds that 70% of analyses considered some family/caregiver costs or health effects, and inclusion of these effects made the incremental cost-effectiveness ratio more favorable in just under half of those studied . In the evaluation of an intervention for self-harming adolescents, Tubeuf et al. find an inconsistent effect of including family spillover effects on the incremental cost-effectiveness ratio, which varies with the quantification method . These papers add to the small but growing body of literature suggesting that the inclusion of spillover effects may not consistently move CEA results in a more favorable direction but can also result in a less favorable economic finding for an intervention. As with any emerging field, there is a need to define new methods. The papers in this special issue propose several new methodological contributions while also highlighting current issues and identifying new areas of needed research. Two notable areas for further investigation address the measurement of spillover. Valuing spillover using conventional measures of health-related quality of life requires much additional research. Current studies provide examples of using both indirect and direct methods for deriving health utility scores and raise key questions, such as the concern that indirect methods may not be sufficiently sensitive to detect spillover effects. The pair of papers that value autism-related spillover suggest that this worry may be unwarranted: in this specific example, spillover as measured using the EQ-5D was greater than spillover measured using a direct time trade-off question. Papers using qualitative approaches suggest a direct valuation approach for spillover may be exceedingly difficult for respondents—to disentangle their own health and simultaneously balance the positive and negative aspects of having an ill family member, especially for caregivers . A superior approach is likely to be the use of a comparison group as described in one set of papers reviewed in Wittenberg et al. . For this type of study design, though, additional resources will be needed to include a comparison sample. Another crucial issue is the question of “where to draw the line” in assessing spillover effects. Most CEAs that have included spillover have restricted this measurement to the impact on caregivers; however, an argument could be made to consider a more comprehensive group of family members [6, 21]. For children, this could include not just parents, but also siblings and grandparents, or even teachers. For other individuals, caregivers can span multiple family members and sometimes close friends. Questions on whose effects should be included require additional debate. The paper in this issue by Canaway et al. presents a qualitative approach to identifying these increasingly inclusive circles of family members and carers . Finally, the issue also includes a spirited debate between two health economists, Werner Brouwer and Christopher McCabe, which was initiated on Twitter. Brouwer provides a strong rationale for the inclusion of spillover effects in economic evaluations while McCabe counters with some words of caution as the field moves forward [22, 23]. As the burden on spillover is increasingly recognized, there has been an attendant increase in caregiver-specific interventions. Outcome measures for these interventions may be different when the intervention target is the caregiver rather than the patient. Questions of equity arise when evaluating tradeoffs between investing in caregiver burden or patient health. A related point is the value that family members derive from the act of caring itself. This can work in both directions, positive and negative, and it is important to acknowledge that the inclusion of spillover on the cost-effectiveness ratio may not always be favorable. How spillover varies across populations will continue to be an important topic. Most papers in this issue focus on children or the elderly as those that carry the highest burden of spillover, but perhaps this will shift as broader measures of spillover [16, 17] are considered. Interesting questions are raised, such as the potential long-term effects of reducing or ceasing employment as a result of caregiving responsibilities, which are likely to be more substantial than simply including an hourly rate for informal care, and heterogeneity in burden, such as whether all caregivers experience effects—burden or otherwise—equally. This issue provides several tools for analysts—methods for valuing informal care , a comprehensive catalog of caregiver utilities , and an algorithm for generating caregiver time using patient-level EQ-5D data . Much guidance is still needed especially in best practices for valuing informal care time and measuring spillover burden via health utilities. Several of the papers in this issue raise caution when using discrete choice experiment approaches to value informal time with respect to potential double counting of health-related quality of life and informal care time. Grosse et al. also raise concerns with endogeneity with regard to time spent in informal care if this time displaces personal care time . Beyond these are even broader questions such as whether health-related quality of life is the appropriate measure given the financial and social effects on caregivers and family members, and whether informal caregiving is a burden that needs to be alleviated at all—or whether simply compensating it would be the preferred policy. This special issue adds to the toolkit available to analysts as they work to measure family spillover effects while also underscoring the vast need for new methods and applications in this field. Gheorge et al. (2019) was included in the January issue of Pharmacoeconomics inadvertently but was submitted for inclusion in this themed issue on family spillover effects. We are grateful to Lundbeck LLC for generous philanthropic support of this issue to improve open access to this issue. This gift was used solely to support open access fees for accepted papers. No sources of funding were received for the preparation of this editorial. Lisa A. Prosser and Eve Wittenberg have no conflicts of interest that are directly relevant to the content of this editorial. Grosse S, Jamison P, Soelaeman R, et al. Quantifying family spillover effects in economic evaluations: measurement and valuation of informal care time. Pharmacoeconomics. 2019. https://doi.org/10.1007/s40273-019-00782-9. Jutkowitz E, Scerpella D, Pizzi L, et al. Dementia family caregiver’s willingness to pay for an in-home program to reduce behavioral symptoms and caregiver stress. Pharmacoeconomics. 2019. https://doi.org/10.1007/s40273-019-00785-6. Arora S, Goodall S, Viney R, et al. Using discrete-choice experiment methods to estimate the value of informal care: the case of children with intellectual disability. Pharmacoeconomics. 2018. https://doi.org/10.1007/s40273-018-0637-2. Hoefman RJ, van Exel J, Brouwer WBF. The monetary value of informal care: obtaining pure time valuations using a discrete choice experiment. Pharmacoeconomics. 2018. https://doi.org/10.1007/s40273-018-0724-4. Brown C, Tilford J, Payakachat N, et al. Measuring caregiver spillover effects associated with autism spectrum disorder: a comparison of the EQ-5D-3L and SF-6D. Pharmacoeconomics. 2019. https://doi.org/10.1007/s40273-019-00789-2. Lavelle TA, Weinstein MC, Newhouse JP, et al. Parent preferences for health outcomes associated with autism spectrum disorders. Pharmacoeconomics. 2019. https://doi.org/10.1007/s40273-019-00783-8. Wittenberg E, James LP, Prosser LA. Spillover effects on caregivers’ and family members’ utility: a systematic review of the literature. Pharmacoeconomics. 2019. https://doi.org/10.1007/s40273-019-00786-5. Canaway A, Al-Janabi H, Kinghorn P, et al. Close-person spill-overs in end-of-life care: using hierarchical mapping to identify whose outcomes to include in economic evaluation. Phamacoeconomics. 2019. https://doi.org/10.1007/s40273-019-00786-5. Ornstein K, Garrido MM, Siu AL, et al. An examination of downstream effects of bereavement on healthcare utilization for surviving spouses in a national sample of older adults. Pharmacoeconomics. 2019. https://doi.org/10.1007/s40273-019-00787-4. Jacobs JC, van Houtven CH, Tanielian T, et al. Economic spillover effects of intensive unpaid caregiving. Pharmacoeconomics. 2019. https://doi.org/10.1007/s40273-019-00784-7. Lin P-J, D’Cruz B, Leech AA, et al. Family and caregiver spillover effects in cost-effectiveness analyses of Alzheimer’s disease interventions. Pharmacoeconomics. 2019. https://doi.org/10.1007/s40273-019-00788-3. Tubeuf S, Saloniki EC, Cottrell D. Parental health spillover in cost-effectiveness analysis: evidence from self-harming adolescents in England. Pharmacoeconomics. 2018. https://doi.org/10.1007/s40273-018-0722-6. Brouwer W. The inclusion of spillover effects in economic evaluations: not an optional extra. Pharmacoeconomics. 2018. https://doi.org/10.1007/s40273-018-0730-6. McCabe C. Expanding the scope of costs and benefits for economic evaluations in health: some words of caution. Pharmacoeconomics. 2018. https://doi.org/10.1007/s40273-018-0729-z.